World Renowned Surgeon. Passionate Author. Motivated Speaker. Devoted Family Man. VICTORIOUS. Bert R. Mandelbaum, M.D., D.H.L (Hon.) is among the world's foremost experts in the diagnosis and treatment of orthopedic conditions, especially those related to the knee. He practices at and serves as Co-Chair of Medical Affairs for the Cedars-Sinai Kerlan-Jobe Institute in Los Angeles, CA. Dr. Mandelbaum spends most of his time there, helping heal patients who have experienced orthopedic injury. Due to his vast expertise, Dr. Mandelbaum's clinical acumen and skill are sought by some of the world's most prestigious athletic organizations. 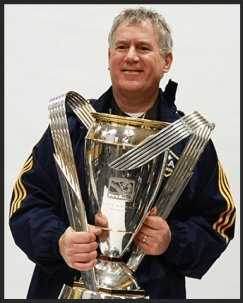 He currently serves as the Associate Chief Medical Officer for Major League Soccer, Medical Director for the FIFA Medical Center of Excellence in Santa Monica, Co-Director of The USOC CSS National Medical Center of Excellence and resides on the USOC National Medical Network Advisory Group. Dr. Mandelbaum also served as Chief Medical Officer for the 2015 World Special Olympic Games in Los Angeles; Chief Medical Director for the 2016 Copa America Centenario and CONCACAF; FIFA IOC Medical Officer for the 2016 Summer Olympic Games in Rio de Janeiro, Brazil; and Chief Medical Officer for the 2017 CONCACAF Gold Cup. Dr. Mandelbaum received his medical degree in 1980 from Washington University Medical School in St. Louis, MO. He went on to complete his residency in Orthopedic Surgery at The Johns Hopkins Hospital and a fellowship in Sports Medicine from UCLA, where he also served as a faculty member from 1986-1989 before going into private medical practice. Bert Mandelbaum is no stranger to writing. As a prolific researcher, he has authored countless clinical research papers on a wide variety of orthopedic injuries and conditions. As a motivational speaker, he has prepared speeches designed to inspire and captivate audiences world-wide. Dr. Mandelbaum understands the power of the written word and compels it into beautiful story-telling. But his inaugural manuscript, The Win Within: Capturing Your Victorious Spirit, is the jewel in his literary crown. Inspired by nearly three decades as an orthopedic surgeon treating thousands of patients from all walks of life – the elite professional athlete, the corporate CEO and every category in between, Dr. Mandelbaum has witnessed a certain "powerful spirit" among many of these individuals. Whether it is their ability to masterfully heal from serious injury to reemerge dominant in their chosen sport, or the way they can keenly focus on a task in front of them while filtering out the background "noise," there's just something about them that screams VICTORY. Dr. Mandelbaum distilled these observations down to one simple truth: In order to become Victorious in anything, the win must come from within. That's easy to say, much harder to do. But Dr. Mandelbaum believes the ability is within ALL of us. Consider The Win Within your road map to success in life, however you define it. If relationships are The Jewels of Life, then Dr. Mandelbaum considers his family among the rarest and most precious stones. Married for more than 20 years to his wife Ruth, a family physician, the couple has three children: Rachel, Jordan and Ava. Since life is absolutely a TEAM sport, Dr. Mandelbaum considers his accomplishments in life a direct result of his strong, supportive and comforting family. With life now taking him on a journey as an author and speaker, Dr. Mandelbaum has harnessed every value and lesson he has learned along the way to become VICTORIOUS. Call it a state of mind, a set of values or simply a way of living – The WIN is within all of us. Waiting. Hoping. Ready for the time when you'll unleash it and begin living the life you were always destined to.